I'm linking up with Diving into 2nd Grade and Hippo Hooray for Second Grade for this great linky party on Quick Tips for classroom organization. 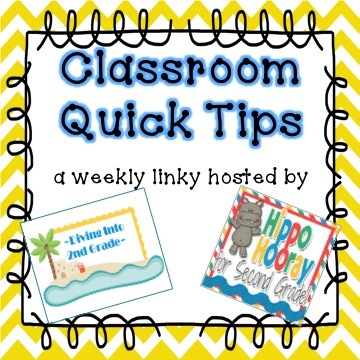 My quick tip is about hallway displays. They are a pain to put up, take down, store, create, etc. And it looks REALLY bad when your winter decorations are still up in May. I put up a bright color paper (not just on my board but on most of my wall in the hallway). Then I put up these "Best Work" signs I made eons ago. When it's time to display work, I just clip it up and that's it. The best part is that I don't have to worry about taking 6 million staples out of the corners of my kid's work when I take it down. Sometimes I pass back all the projects for the week, tell the kids to pick their favorite one, and they go put it up themselves. I love this because I can put it up in September and leave it there until June. Easy Peesy. The signs were super easy and quick to make too. These signs have lasted me 4 years. I actually just put them in the trash can a week or two ago. I'll make new ones this summer and be set for another few years. Got a Quick Tip of your own? Go link up! LOVE it! I had the same project up from the end of October through the beginning of April! ( I didn't feel so bad because it was IN our room, but STILL!) How do you get the paper to stay is my only question? I tried putting up some paper in the hallway to make a mock bulletin board last year and it didn't stay up very well. There are cork strips on the parts of the wall that don't have a physical bulletin board so I can staple the paper on the top and just tape the middle and bottom. Also, since you're not stapling or taping anything to the actual paper, it lasts a lot longer. Cute idea! Some of the teachers in my school hang lines with clothespins outside their door to do the same thing. It looks so much cleaner.